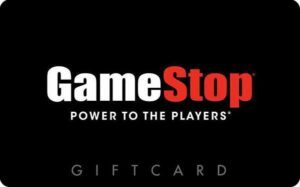 Step up your game with a discounted Gamestop gift card! Anyone who loves video games will tell you that this is the place for all your gaming needs! As a gaming entertainment, personal electronics, and wireless services retailer, they have it all. And they even offer the best games for the best prices! If you’re looking for anything involving video games, then you can find it here. From video game hardware & software to smartphones & tablets, and everything in between! And best of all, now you can pay less money! Whether you use your discounted Gamestop gift card to buy something for yourself or for your favorite gamer, the result is the same. Simply put, you will pay less money for the same great gaming gear. Get your card today and enjoy the lowest possible prices on all the popular name brand games and gaming consoles! Not only do they carry Xbox, PlayStation, and Wii gaming consoles, but they also have a huge variety of new and used games! Or maybe you’re in the market for pre-owned smartphone or tablets? Good news, they have plenty of those too! Today is the day to start saving money on all your video games, consoles, gaming accessories, and collectibles! Are you looking for top quality gaming products and excellent customer service? If so, you can find it here. Stop in today and test gaming products for yourself on their demonstration consoles provided in every store. Beyond this, they even offer a unique buy-sell-trade program that allows avid gamers to upgrade to the latest technologies for less money. And just think, because gift cards are as good as cash, you can combine your trade credits with the gift card balance to make purchases! So why wait any longer? Purchase Your discounted Gamestop gift card today and stop by one of their more than 6000 stores worldwide and save money on the games you love! Do you have a Gamestop gift card you would like to sell? If gaming is no longer your thing and you’re looking to trade your Gamestop gift cards (or gift cards to other desirable stores) for cash, contact Cards2Cash today. We buy gift cards to many popular retailers! In fact, we buy them for everything from shoe stores to ice cream shops! Why hold onto something you aren’t going to use when you can be paid money for it instead? If interested, stop by one of our retail locations for cash on the spot or fill out our online form and we’ll get back to you with an offer you can’t refuse! Just remember, Cards2Cash is your ticket to saving money!